DOING things differently is a great way to stand out from the crowd, and when it comes to free range chicken farming, that’s quite a crowded space to be playing in. So when Mount Cotton, Queensland-based Golden Cockerel (jointly owned by Woodlands Enterprises and Darwalla Group) looked to branch out and explore a niche in the free range meat chicken industry, the business knew it had to think outside the box if it wanted the venture to succeed. Most free range meat chickens are permitted access to run freely outdoors for a couple of hours a day where they can forage and roam to their hearts’ content. However, this poses an obvious biosecurity risk in that while out and about in the great outdoors, these chooks can come into close contact with other birdlife including ducks and pigeons, not to mention the threat of predation from foxes and birds of prey such as falcons and hawks. To combat these issues, the Golden Cockerel team concocted a novel solution – enclosing the free range area on all sides with special netting to protect the birds from threats both airborne and on the ground. And so the Elgin Valley Free Range concept and brand was born. With the first farms developed and operational in the foothills of the scenic Glasshouse Mountains in February 2016, up to 60,000 birds a week have been travelling for a little more than an hour by truck to the processing facility at Mount Cotton, minimising both stress for the birds and transport costs for the business. Recently speaking with Golden Cockerel’s Sales Manager Wayne Sullivan and Business Development Manager Kerry Stewart regarding Elgin Valley Free Range, the pair was able to reveal that production capacity will be doubled in coming months thanks to the repurposing of existing farms in the Redlands area not more than five minutes from the processing facility. As well as the huge increase in production capacity, the new sheds located ‘just down the road’ will massively cut transport costs and times, allowing more time and money to be spent on further improving welfare of the birds and developing optimum feed options. At a cost in excess of $10 million, this expansion is no small investment, but one that is expected to pay off. As well as adding the netting-enclosed free ranging area attached to the existing sheds, the repurposing involves opening the sheds right up to allow the birds optimum access to the outdoors, with Elgin Valley committing to doors at least 40 percent larger than competitive free range farms (and double the required free range standard). Both indoor and outdoor spaces are similar in size to minimise stress for the birds and the barn doors are opened all day from about 4.30am to 5pm to allow the chooks maximum ability to roam. 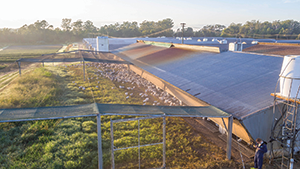 Going above and beyond for the welfare of its chickens saw Elgin Valley Free Range receive the ‘Accredited Free Range’ stamp early on from Free Range Egg and Poultry Australia. Recently, a more recognisable tick of approval has been garnered by the brand, with RSPCA giving Golden Cockerel the nod to affix the RSPCA Outdoor Approved label to its products. This is big news and will certainly improve Elgin Valley brand recognition for consumers shopping at independent retailers, barbecue chicken shops and butchers who meet Wayne and Kerry’s high standards for product display and brand positioning, with butchers making the cut needing a good shopfront presence and the ability to add extra point of sale material. Adding another string to its bow is Elgin Valley’s capacity to distribute either plain or marinated birds throughout Australia, depending on the request of the customer. 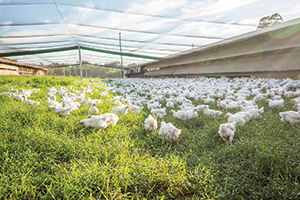 Price wise, the free range chooks meet the market and while in some instances they may be priced slightly above the competition, the team believes the premium is justified thanks to the higher standards of welfare and biosecurity afforded to the birds. All those involved in Elgin Valley understand the importance of differentiating the premium free range chickens from conventional chooks and as such the free range birds are always processed first at Mount Cotton, with a 30-minute break before conventional bird processing begins to ensure total segregation. In terms of feed, of course the Elgin Valley birds are fed a special blend of wheat, sorghum, canola and soybeans free from antibiotic growth promotants, preservatives and added growth hormones, as well as whatever else they can find while safely free roaming in the yards. With several new farms in the Redlands soon to come on-line and production capacity set to increase accordingly, expect to be seeing a lot more Elgin Valley Free Range-branded product in retailers near you. 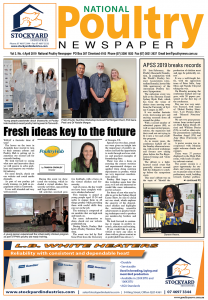 Also keep an eye out in coming editions of National Poultry Newspaper for coverage on the expansion and a more up-close look through the Elgin Valley operation to see exactly how the brand is doing things differently and standing head and shoulders above the crowd.